Pluto might not officially be a planet anymore, but that doesn’t make it’s any less interesting. One of the most important objects of inquiry regarding the distant dwarf planet has to do with its formation. Now, thanks to unprecedented observations carried out by spacecraft like New Horizons and Rosetta, scientists are coming close to understanding how Pluto came to be. One of the craziest, but still plausible, Pluto formation theories was recently unveiled by researchers at the Southwest Research Institute (SwRI). They suggest that Pluto might have been formed by one billion comets that came together. 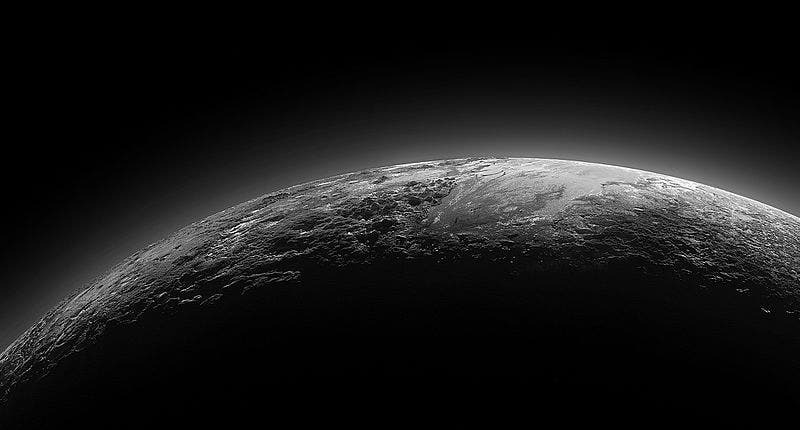 Just 15 minutes after its closest approach to Pluto on July 14, 2015, NASA’s New Horizons spacecraft looked back toward the sun and captured a near-sunset view of the rugged, icy mountains and flat ice plains extending to Pluto’s horizon. Credit: NASA. The solar system‘s planets formed by accretion of material from enormous discs that surround the early Sun. The matter inside the rapidly spinning disk around the parent star simply gathers and forms clumps, steadily accumulating until these turn into asteroids, comets, planets, and moons. Pluto was always thought to have formed much in the same way. However, geochemist Christopher Glein and colleagues at SwRI’s Space Science and Engineering Division found it odd how the dwarf planet and the famous Comet 67P/Churyumov-Gerasimenko — the one where ESA landed a probe in 2014 — share so much of their chemical makeup. For instance, Pluto’s nitrogen-rich Sputnik Planitia is unnaturally similar to Comet 67P. Just as water is the main driving force that shapes Earth’s surface, so is nitrogen for Pluto. Due to its low viscosity, nitrogen flows like glaciers on Earth, eroding the bedrock and, in the process, altering the landscape. And there’s so much nitrogen on Pluto. Earth’s atmosphere is made up of 78% nitrogen, but Pluto’s, which is far colder, is 98% nitrogen. That’s an unusual proportion of nitrogen, both at the surface and in the atmosphere, which is not easily explained by the conventional planetary formation theory. Instead, what seems to connect the dots is a huge comet frenzy. “We’ve developed what we call ‘the giant comet’ cosmochemical model of Pluto formation,” Glein said in a statement. Real photo of 67P/Churyumov-Gerasimenko. 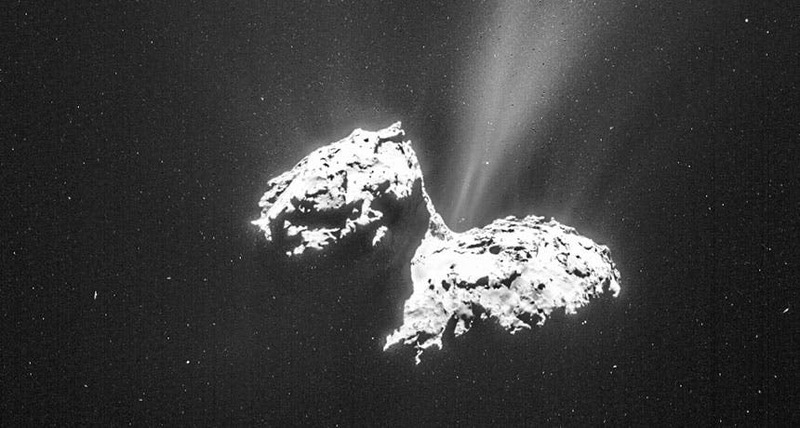 Credit: NAVCAM/ROSETTA/ESA. The researchers got their data from the Rosetta probe that reached comet 67P and NASA’s New Horizons mission, which flew by Pluto in July 2015. In the new ‘giant comet’ cosmochemical model, Pluto’s initial chemical makeup is inherited from comet building blocks but was later changed by liquid water. “This research builds upon the fantastic successes of the New Horizons and Rosetta missions to expand our understanding of the origin and evolution of Pluto,” said Glein. The new study is set to appear in the journal Icarus. It is already available online on the pre-print server arXiv.